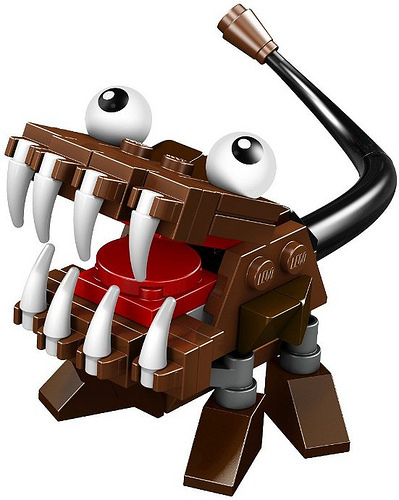 The first official images have surfaced of the second wave of Mixels, LEGO’s new popular cute miniature creatures line. The first wave consisted of three colored factions of red, yellow, and black, representing Fire, Electricity, and Stone, respectively. This new lineup comprises orange, brown, and blue as creatures of Undersea, Monsters, and Air (or at least, that’s my best guess as to what their themes are). At any rate, they’re just as ferociously adorable as ever. While they’re all lovable, my favorite has to be Jawg, because it reminds me of Harry Potter’s growling Monster Book of Monsters. I also love the helmets used as eye-sockets on Slumbo. In the U.S. at least, all three series are pictured in the instruction manual. The three tribes are called the Frosticons (blue), Fang Gang (brown), and Flexers (orange). The Frosticons, as their name would suggest, are ice-themed. The Flexers are clearly sea-creature themed in terms of design (though their habitat and tribe name suggests a rubber theme), and the Fang Gang bizarrely seems to follow an… eating theme. I love the variety of builds and personalities on display here. The Mixels theme is brilliantly imaginative and I’m glad to see that AFOLs are embracing it. These pictures were tiny and on the side of the Mixels series 1 box. I would have taken a good picture and posted it months back but I am too meh over the whole line.